Renault unveiled the Fluence Z.E. Concept at the Frankfurt auto show. Renault SA's plant in Bursa, Turkey, will produce the Fluence mid-sized electric car starting in the first half of 2011. The sedan, which is based on the Fluence Z.E. Concept that debuted at the Frankfurt auto show in September, will be made on the same production line as the fuel-powered versions of the Fluence. Bursa is the fourth and final production site chosen for Renault's planned lineup of electric cars. Renault promises that the electric version of the Fluence will have the same starting price as variants with combustion engines because of Bursa's affordable labor and its proximity to key suppliers, which will help keep down logistic costs. The Fluence will be launched in Israel and Denmark in the first half of 2011 then rolled out in other countries. Israel and Denmark will get the car first because they were the first to team up with Renault and partner Better Place, a U.S.-based company that will import and distributed the cars and manage the pubic re-charging network in both countries. In September, Renault and Better Place committed to providing at least 100,000 electric vehicle for both countries by 2016. Renault has been the most active European automaker in the field of electric cars. 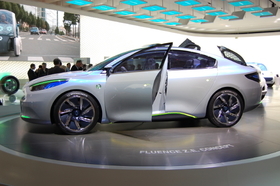 French rival PSA/Peugeot-Citroen also has ambitious electric car plans. Last week, Citroen said it will launch an electric minicar called the C-Zero starting in late 2010. The car will be a sister model to Peugeot's iOn, which was unveiled at the Frankfurt auto show in September and will go on sale around the same time as Citroen's variant. Both cars are based on the Mitsubishi i-MiEV, which has been on sale in Japan since this summer.